Eliminate headaches associated with late time submittals, missing information and error-prone timesheets. There is a better way for your field workforce to submit their time and other daily reporting—using their smartphones, tablets and laptop PCs. PowerTrack’s mobile timekeeping provides project managers and office personnel with daily visibility to job labor while eliminating the need for office key entry. Quickly record employee and subcontractor clock ins and outs, entering data for an individual or an entire crew at once. Use your existing mobile devices or upgrade to biometric (fingerprint reading) or badging solutions for increased accountability. PowerTrack will present the user with filtered lists of active jobs and valid cost codes to apply time for labor entry and project costing. PowerTrack applications leverage familiar Android and iOS controls for time entry, enhancing learning and usability. Optionally, the system can be configured to calculate the time worked (from the clock in/out data) for a selected employee and guide the user to allocate the remaining balance to jobs and cost codes. In addition to the standard smartphone format, our daily timesheet provides iPad and Windows PC users with a familiar spreadsheet-style entry format. Record actual clock times when starting new jobs/cost code work, and PowerTrack will calculate the time duration for each work segment. Starting the next job or cost code will complete the previous work segment. 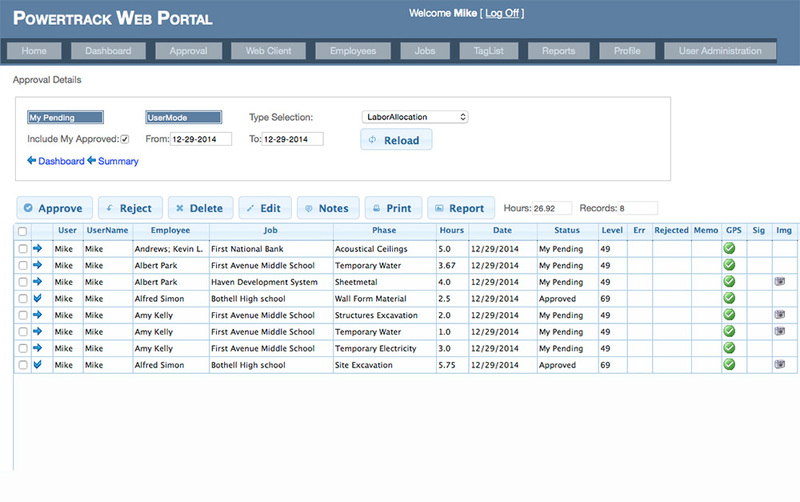 Log in to PowerTrack’s web portal to review, edit and approve labor records. Set up multiple levels of approval for project managers and higher level supervisors. Payroll staff can review approved records and export records to your company’s payroll/accounting system.